مقاله حاضر شامل مطالعه‌ای مقطعی با هدف بررسی الگوی استفاده از رایانه و اینترنت در میان آسیب‌دیدگان نخاعی و ارزیابی ارتباط بین استفاده از اینترنت و کیفیت زندگی است. شاخص‌های مورد استفاده عبارتند از: خود ادراکی از وضعیت سلامت، وضعیت سلامت در مقایسه با سال گذشته، شدت افسردگی، همبستگی اجتماعی، سرگرمی، تماس با دوستان، تماس‌های شغلی و رضایت از زندگی. یافته‌ها نشان داد اغلب افراد مورد پژوهش دارای رایانه هستند و به طور منظم برای دریافت نامه‌های الکترونیکی، کسب اطلاعات بهداشتی و خرید لوازم مورد نیاز از اینترنت استفاده می‌کنند. تحلیل‌های دو متغیره آشکار کردند که تفاوت معنی‌داری در دسترسی به اینترنت بر اساس خصوصیات جمعیتی‌ ـ اجتماعی (بخصوص در افراد دارای تحصیلات پایین و امریکایی‌های افریقایی و اسپانیایی تبار) وجود دارد. This article is based on a sectional study carried out with the aim of investigating the pattern of using internet and computer among patients with a spinal injury. The article furthermore, assesses the relationship between using internet and the quality of life. The indexes used are as follows: being aware of oneself health condition, health condition compared with the previous year, the level of depression, social solidarity, obsession, contacts with friends, business contacts, life satisfaction. Findings show that most of the individuals involved in this study had access to computer and used internet regularly for checking their E-mails, looking for health information, and purchasing goods. Two-variable analysis revealed that there is a meaningful difference, with regard to having access to internet, among individuals with various degrees of education and also in African Americans and Spaniard Americans. حلم سرشت، پریوش و دل پیشه، اسماعیل (1382) فرهنگ اصطلاحات علوم بهداشت، تهران: چهر. رفیعی‌فر، شهرام (1383) از آموزش سلامت تا سلامت، وزارت بهداشت، اداره کل ارتباطات و آموزش سلامت. 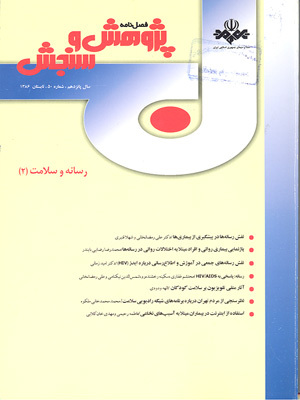 خان‌کلانی، مهدی (1386) بررسی تأثیر آموزش مهارت‌های زندگی بر کیفیت زندگی کارمندان زن دانشگاه علوم پزشکی تهران، پایان‌نامه. حمیدی‌زاده، صفدرو صالحی، کمال (1383) بررسی کیفیت زندگی سالمندان شهر تهران، ‌اولین همایش سراسری کیفیت زندگی. رضایی آدریانی،‌ مرتضی و الحانی، فاطمه (1383) کیفیت زندگی و تأثیر انواع مختلف آن بر درد، اولین همایش سراسری کیفیت زندگی. Cronina, M. E. (1996) Life skills curricula for students with learning disabilities: a review of the literature. journal of learning disabilities, 29 (1). Houlinhan, B.V. & Drainoni, M. & Warner, G. & Nesathurai, S. and Wierbicky , J. (2003) The impact of Internet access for people with spinal cord injuries a descriptive analysis of a pilot study. Disabli Rehabil 25 . Engelberg, E. and sjoberg, L. (2004) Internet use , social skills , and adjustment . Cyberpsychol Behave (7). Nalwa,. K. and Anand. A.P. (2003) Internet addiction in students a cause for concern. Cyberpsychol Behave (6). Wastlund, E. & Norlander, T. and Archer, T. (2001) Internet blues revisited replication and entension of an Internet paradox study. Cybrpsychol Behave. Modayil, M.V. & Thompson, A.H. & Varnhagen, S. and Wilson, D.R. (2003) Internet users prior psychological and social difficulties. Cyberpsychol Behave (6). kruege,r A. and Krues, D. (1995) Labor market effects of spinal cord injuries in the dawn of the computer age. Labor market effects of spinal cord injuries in the dawn of the computer age . National Bureau of Economic Research , Cambridge (MA) Oct. Working parer No w5302 http://www.nber.org/papers /w5302 Accessed JULY 15, 2004. Pell, S.D. & Gilles, R.M. and Carss, M. (1997) Relationship between use of technology and employment rates for people with physical disablilties in Australia implications for education and training programmes. Disabil Rehabil (19). pell, S. D. (1999) Use of technology by People with physical disabilities in Australia. Disabli Rehabil (21). Kaye, H.S. (2000) Computer and Internet use among people with disabilities. Report (13). san Francisco: Disability statistics Center, contract No H133 B980045. http://dsc.Ucsf.edu/pub listing.php?pub type = report Accessed july 30 , 2004.
http://www.ntia.doc.gov/ntiahome/fttn99/contents.html. Accessed July 30 , 2004. Accessed July 30 , 2004.
http://www.rcep6.org/IRI Forward.htm.Accessed July 15 , 2004. Hampton, N.Z. and Houser, R. (2000) Applications of computer – mediated communication via the Internet in rehabilitation counseling. J Appl Rehabil counseling (31).